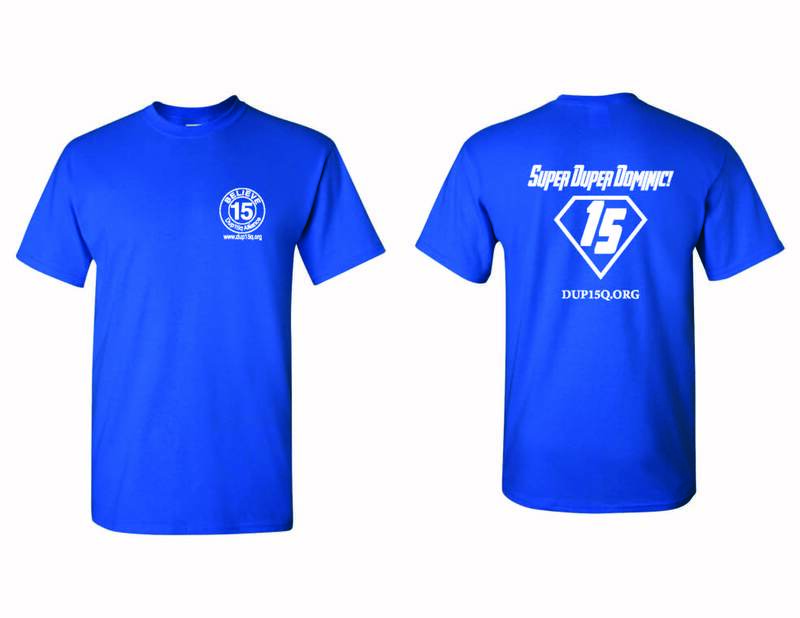 Order your Super Duper Dominic T-shirt to support the Dup15q Alliance. Dominic was diagnosed with Dup15q Syndrome when he was 2 1/2 years old. Dup15q Syndrome is a rare genetic disorder that can cause developmental delays, sensory processing disorder, epilepsy, behavioral issues and is the leading genetic link to Autism. To learn more about Dup15q Syndrome visit the Dup15q www.dup15q.org. Dominic is non-verbal but is a very active, friendly boy with a heart a gold. Let's support good in the world and make a difference. Funds raised will support the Dup15q Alliance, the mission is to raise awareness and promote research into chromosome 15q duplications, to find targeted treatments so that affected individuals can live full and productive lives.